Week 6 was great. Hair is still doing well, not doing a lot to it. Found that large braids pulled into a bun is a simple, quick do that keeps my ends detangled and allows me to rinse without worrying about matting from twists. Nothing much to add. Hair is still amazing, I have been switching detangling methods. One week, I’ll finger detangle since it leaves such amazing clumpy curls, the next week I’d use a comb to detangle since my hair is very fine and I don’t want to worry about matting. Braids have helped tremendously with matting. I am still slow with braids, so I haven’t worked myself up to making small braids, though that would be a nice hairstyle for 2-3 weeks, especially since it doesn’t seem to tangle and mat as much when I rinse my hair in braids. Hair is nicely moisturized and I’m trying to resist the temptation to do more. Do more styles like the other challengers, do more oil treatments, mosturizer treatments, try new products, etc. My hair seems to like this plain and simple routine of wash weekly, add conditioner, install 6 big braids and pull into a bun. Repeat. My hair is amazing, honestly, the curls pop so much and they are clumping in bigger sections now, it’s like a new head of hair…though other RL issues are going on as well, so maybe that has a lot to do with it too. Other things have been going on as well, I’ve been getting crafty a’la Jen over at BabyMakingMachine and making a cool shirt project that I can’t wait to share. Also started sewing with a friend, our next project is a baby blanket which should be fun. Week 5 was much better. My hair has finally “rebalanced” and is soft and moisturized. I was able to keep the last braids for almost two weeks before washing them and my ends are amazing! The generous trimming has been paying off, but not in terms of length, but at least my ends are healthy and shiny and smooth like seaweed. I wore six big braids this past week that were wrapped around each other towards the back and placed in a low bun. Flowers made the bun look a bit different each day, though I need to experiment more with scarves. To be honest, I haven’t had my mind on my hair that much, other RL things are going on. This is probably a good thing for my hair as well, since I tend to do the braided bun and leave it alone aside from spraying my rosemary spray daily. No length check, I plan on doing that at the end of the challenge. I have noticed that my curls are clumping more and that some of them are hanging lower than before, but nothing official yet. Week 2 of the PYE Challenge wasn’t that good. At all. Thankfully my hair was tucked away. Unfortunately, my hair was tucked away, so it was later in the week when I realized just how dry and “icky” my hair felt. So Week 3 of the PYE Challenge was focused on rebalancing my hair. To help remedy that, I did a baking soda deep treatment. Basically, I cowashed my hair. Then I applied a baking soda-conditioner mix. 1/3 baking soda to 2/3 conditioner. I applied the mixture to my hair and cover with a plastic bag. After 30-45 minutes, I rinse the mixture out and follow with a light AVC rinse. I did twelve big braids and then flat braided those braids together to go around my head and meet in the back. I then made a ponytail, braided the end and tucked the ends. I did the multipony tail again with the big braids. So far, much less tangles and scalp more moisturized thanks to my rosemary spritz. Next time I do the baking soda deep treatment, I don’t think I’ll follow with the ACV rinse, my hair was so soft after the DT, but then the ACV rinse made it feel “squeaky”. I almost feel like I’m relearning my hair for this challenge, which is odd since it didn’t give me any trouble in terms of moisture and dryness the entire latter part of the year and I was wearing the multipony weekly and keeping my ends tucked away. Perhaps less is more and the braided multi-pony with rosemary spritz is all I need. The whole sealing my ends with oils hasn’t worked so far and left my hair worse than before, so I’ll be returning to sealing with conditioner after I cowash. Wish me luck. Have you tried anything new in your hair that didn’t work out as planned? I did a hot oil treatment last time, you can read about the results here. I was still rinsing oil out of my hair and waiting for my hair to “balance itself out”. This week I did chunky two strand twists-about 20 total in my hair. I then wore my signature multiple pony, but with a twist. Since the ends needed to be tucked in, I had to make adjustments. I gathered the first section of my hair and made a ponytail. I then gathered the second section of my hair along with the end of the first ponytail and made a second pony-tail. I braided the loose end. Then took a booby pin and anchored the end of the braid into the braid itself, by folding it under. This style is easy and quick, notice a theme yet with my styles 😛 By the time it was looking rough, it would be time to wash it again 🙂 Not a bad weekly style. I am doing weekly styles since I struggle with dandruff and have to rinse my scalp at least twice a week. This does havoc on my styles such as two-strand twists, so I simply try to find weekly styles, or at the most, styles that last two weeks-like my two strand twists. How often do you change your hair style? I have decided to bookmark a few styles that would help keep my ends protected during the “Protect Your Ends” Challenge at Black Girl Long Hair. African-Amish Tuck and Roll at A Curl’s Best Friend. I will try to adapt this to use with twists as well. Do you have any styles that you recommend? It’s been a bit over a week (Jan 1-8), but thanks to deadlines with journals, I couldn’t update. The first week was too much manipulation. I was still out of the country visiting family and was trying a new side challenge of using four or less bobby pins. My hair was in two strand twists, but I did a lot of different updos thanks to the multiple events we had going on from New Year’s Eve parties, to dancing in fancy hotel ballrooms and some perfect beach days. Basically, I took the hair and separated it into thirds. Two on either side of my head and one for the back. 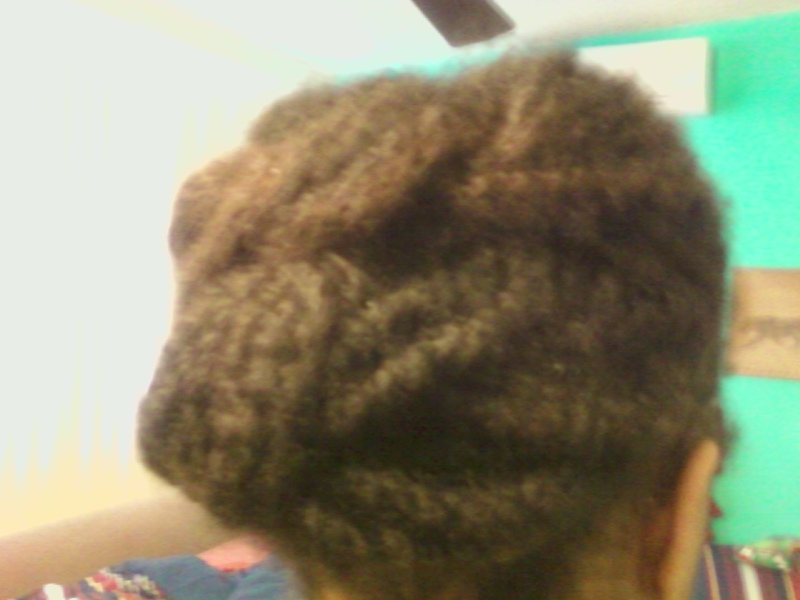 Then, I took the back section and made a two-strand twist. I pinned the twist to the top of my head, taking care to fold the ends under the twist. I then took a side section and made a two strand twist. 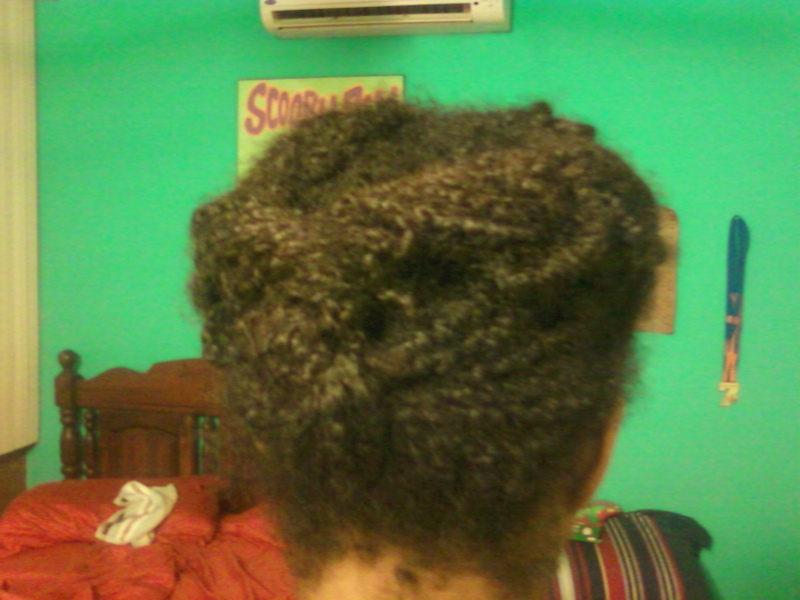 I wrapped the twisted over and then under the back twist and pinned it down. I did the same with the other side. The style only used three bobby pins and was pretty cute and very fast and easy to do. It can be done on loose hair as well, or chunkier twists. I will be adding this style to my options of the PYE Challenge, but I might had a few more bobby pins, so I can wear it for several days before taking it down. With only three bobby pins, I had to redo the style each day. However, that might be good as it allows my hair a chance to “rest” without tension, besides I’ll have to take it down at least twice a week-once to do a rinse so my scalp can get moisturized and once for wash day. Speaking of, for those who have to rinse your scalp often due to dandruff, do you have any tips on how to get by going a full week without rinsing the scalp, or is this just something that has to be done for the health of the scalp?